Organizations have become increasingly desperate to find new ways to improve their adaptability to change. And the rate of change will only accelerate. The world has been flattened, we are a global, interconnected network and must interact with diverse sets of individuals, groups and communities. The models we use to try to assist organizations in this complex global environment therefore need to have built-in flexibility so they can grow and change-as everything does. Two major themes have emerged in the development and application of temperament theory. The first is the shift from categorizing to increasing adaptability and resilience. The second is a distinction about just what kind of information this theory brings to the understanding of human behavior and individual differences. Each of these themes influences how we need to look at and use temperament theory in the next century. In the 1980s and 1990s, the idea of personality type was becoming very popular. It seemed enough to just categorize and name. An illusion of order and control existed as we had name badges listing our types and temperaments and "INTP spoken here" signs sitting on our desks. People were desperate for applications, especially for job selection, and way too many people used type and temperament theories in unethical and ineffective ways. Labeling, pigeonholing and stereotyping became the norm. While fascinating, categorizing was not very effective, so we saw a backlash against it. When people are in the "forest of categorization," they don't recognize that all of nature occurs in patterns and that it is useful to understand those patterns. The patterns endure. No matter what, our feet don't show up on our shoulders! And more importantly, if we know what a natural pattern is, we can work with it instead of against it. We really are driven to use our temperament-related talents to get our core needs met and to avoid or defend against temperament-related stress. Knowing this, we can take responsibility for getting our needs met and helping those we care about.Resilience comes when we are strong in who we are. After all, "When you know who you are, you are freer to be who you're not!" The temperament model provides profound insights into people's deep motivations, core psychological needs, core values, talents and communication patterns. The model provides a map to different perspectives and approaches to problem solving, creativity and communication. Temperament theory brings information to us about how we are motivated. It is primarily about conation-our will or intentions. The core needs of each temperament are so strong that we go to great lengths to protect ourselves from not getting them met. Temperament theory doesn't belong to any one person. It belongs to the realm of universal knowledge, and many people have tapped into that knowledge. I've worked with this theory intensively since 1975, when I first learned about Ernst Kretschmer's view that people go crazy in different ways and that those ways are related to the ways people are when they are functioning well. In other words, it takes a certain talent to go crazy in a certain way. Over the last 30 years, my understanding of temperament theory has evolved and I have dedicated my professional career to evolving the theory-teaching it to thousands of professionals as well as clients. Names have the potential to make or break the acceptance of a concept. It is important to find names that reflect the kinds of information the four temperament patterns bring to understanding personality differences. Over the years, people have called the four temperaments by many names. Having been a student of David W. Keirsey, I began using the names he gave them in 1987. However, at Interstrength Associates, we found that these names presented some problems when facilitators helped people figure out their best-fit temperament pattern. Participants in our workshops would often reject the temperament pattern we were calling "Artisan" because they didn't see themselves as artistic, when being artistic is not the essence of the pattern. At the other end of the spectrum, certain names such as "Rational," resonated with participants-who wouldn't want to be called "rational" since its opposite is "irrational." And in the business world, being an "Idealist" is not highly valued since we have to deal with the "real" world. The names themselves also were contributing to some biases that we wanted to avoid. It is impossible to name a pattern with any one word that has no flaws and works for everyone in all cultures, so as we set out to find new names, we developed criteria for selecting names based on the depth of our experience. The criteria consisted of three core ideas: each word had to be active, had to describe a contribution to organizations, and had to get at the talents as well as the core values of the temperament pattern it identifies. The response from our reference group has been positive. We think the names will contribute to the effectiveness of the work that the professional community is pursuing and reflect the evolution necessary for growth and development of the theory. Here are some brief descriptions that show how the names work. To catalyze is to engage with others in a way that promotes their identity without losing one's own identity. Catalyzing is natural to those who need to have a meaning and purpose to their lives. It is the means to self-actualization. Stabilizing prevents groups and institutions from falling apart. It is fundamental to creating an environment where one can be secure in a sense of belonging. It provides the means to economic security and behaving in a responsible way. Understanding and developing theories provides the basis for mastery and competence. It is fundamental to success in business as well as in school. Businesses are built on scientific discoveries and innovations. Theory is the means to understanding an objective truth on which to build a path to achievement. To improvise is to vary your actions to get a result using whatever is at hand. In an ever changing environment, improvising is greatly needed. It is the ultimate expression of the freedom to respond to the needs of the moment. It is also the means to create pleasant aesthetic experiences. A major advance in temperament theory is the delineation of the temperament dynamics. Our understanding of temperament dynamics can increase our flexibility to meeting others at their view of the world. Each temperament has something in common with the other temperaments, so there is always a way to connect and a map for what behaviors to change. For example, if you are of the Catalyst or Theorist temperament and you are having trouble communicating with someone of the Improviser or Stabilizer temperament, translate your language into more tangible, concrete specifics. Likewise, if you have an Improviser temperament, you can shift from a pragmatic, do-what-works role to an affiliative, cooperative role in order to work more productively with your Catalyst colleague. The same is true for the Motive/Structure dynamic. So rather than being just ways to better understand and identify the temperaments, the understanding of temperament dynamics is actually a means to increase adaptability. The ability to flex and adapt when communicating with others is possible when you first know who you are and then use temperament in the most powerful way possible-as a communication tool. The shift from categorization and naming to growth and adaptation is also facilitated by the use of other models. The Interaction Styles model gives us ways to be more flexible within our real-time interactions, the Cognitive Dynamics model provides a whole map for additional skill development and psychological development. We live in an age in which we are constantly bombarded with information and must be evaluate the usefulness of the information. Go into any bookstore and you'll find at least 20 books on personality differences, all using different frameworks but all being variations on themes that have been around for centuries. Many of these credit their sources. Many don't. When we at Interstrength® Associates, explored the most popular models, we discovered that three bring an incredible amount of information to understanding personality differences and can be integrated to form a more complete understanding of human personality. We created the name Interstrength® to embody the concept of the integral personality within our multiple model approach-ever growing, adapting and evolving. These three models address the three classic domains of psychology-the cognitive, the affective and the conative. Cognitive Dynamics Two kinds of "perception" or awareness and two kinds of "judgment" or evaluation, each used in either the external or internal world. The 8 cognitive processes are arranged in 16 patterns of preferred use and development. Interaction Styles Kinds of motoric predispositions to react to stimuli in certain ways. Patterns characterized by a drive toward an aim, with an underlying core belief. The styles show up as observable energy patterns as we interact with others. It is important to remember that each model is suited for different kinds of applications. For example, the content of a conflict is often rooted in one's temperament pattern, but the style of handling the conflict is determined more by one's interaction style pattern. How one mentally processes the conflict and solves the problem is influenced more by his or her preferred pattern of cognitive processes. Thus, each model addresses different aspects of conflict. On the other hand, it seems that the Interaction Styles model is the most useful in situations where coworkers are not co-located and that the other models don't address the issues involved. Temperament theory has been around for centuries, but the last half of the 20th century saw a proliferation of explanations and names. The theory had a resurgence of popularity in the 1920s, died out for a few decades, and was made popular again in the last quarter of the 20th century through the work of David Keirsey and his graduate students. With the publication of the new Understanding Yourself and Others®: An Introduction to the 4 Temperaments-4.0 and the integral view of personality that Interstrength® Associates provides, we have begun a new era in the development and understanding of human personality. 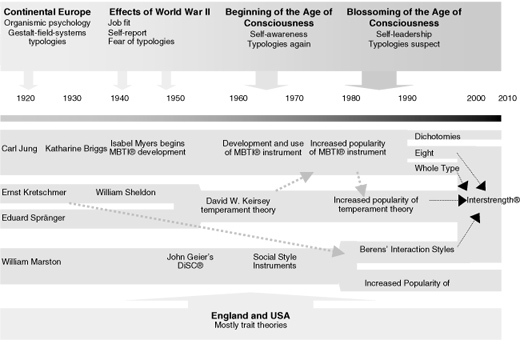 The following graphic shows the history of where temperament theory fits into the world of personality typologies since the early 1920's. 1 Linda V. Berens, Understanding Yourself and Others®: an Introduction to Temperament-4.0, (Huntington Beach, CA: Telos Publication, 2010) 34. About Linda V. Berens, Ph.D.
Linda V. Berens is the founder of Interstrength® Associates, which provides organizational consulting and interventions as well as certification of trainers in the Interstrength® assessments and method and Myers-Briggs Type Indicator® (MBTI®) Qualification programs. Linda has spent over twenty-five years helping individuals and teams recognize their strengths, transcend their weaknesses, and work together better. Linda is recognized internationally for her theoretical contributions to the field of psychological type and for developing user-friendly training materials for practical application of understanding personality differences.